Raekoja plats (English: Town Hall Square) is a town square beside Tallinn Town Hall (Estonian: Raekoda) in the center of the Tallinn Old Town in Tallinn, Estonia. It is a venue for numerous small festivals or concerts like Tallinn Old Town Days (Estonian: Tallinna Vanalinna Päevad), and several bars and restaurants are located in the near vicinity. The square also hosts a market regularly, with many stalls selling traditional Estonian items and souvenirs (Estonian: Suveniirid). 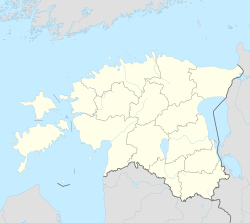 Location of Tallinn and the square within Estonia. Map of the Tallinn old town with Raekoja plats highlighted in orange. There has been a town hall in Tallinn since at least 1322 and a town square next to it ever since then. The hall was rebuilt from 1402 to 1404 into its current form, and a Christmas tree display has been held in the square since 1441, making the Tallinn Christmas tree display over 570 years old. Wikimedia Commons has media related to Town Hall Square.